Mr T A Gedling, former headmaster of Cleadon Park Junior School, South Shields, presents the A J Wares Cup to the captains of Red House, the winning house at the school's sports day. Looking on is headmaster, M P Ward. It’s funny what people bring to mind when it comes to thinking back to their school days. Many would share the recollections of Ann Sharp who recalls bottles of warm milk and making and waving Union Jack flags. Back in July 1971, pupils of Cleadon Park Junior School with their headmaster Mr Pnilip Ward, who has retired after 15 years at the school. But what about playing “American skippy” or listening to the strains of the William Tell Overture? 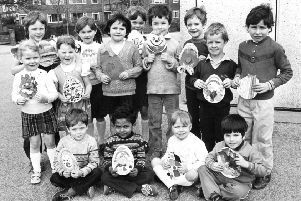 These, and other memories, are featured in a second extract from the writings of local historian Andrew Grant, who quotes Ann and others as part of his research into the history of education here on South Tyneside. Ann was speaking about her time at Cleadon Park Infants School which opened in 1931. Andrew says she wrote about how she was taken to the infants school by her mother when she was five years old; being “confused” by the new experience. “She remembers playing with sand and water,” said Andrew, “and having to remember a list of words for homework”. “This was followed by spelling tests, flash cards and word recognition games; this was how she was taught English. For physical education, the sandshoe-clad youngsters were encouraged to “become trees or flowers” while out in the playground “the girls played tag and ball games and American skippy”. “Everyone at the school remembers warm bottles of milk, sitting cross legged at assemblies, the William Tell overture, never ‘putting off tomorrow, something you can do today’ and sitting in the classroom with hands on head until the bell went. From the infants, Ann moved to the junior school, which opened in 1939. During that time, she remembers going to summer camp where “the girls learned to knit maroon and blue woolly hats which helped identify the children from Cleadon Park Juniors when they were in the Lake District”. John Stewart taught in the senior school at Cleadon Park in 1959, teaching general science, and at times geography, biology and pastoral education. Andrew reveals that by the 1960s the school had 1,100 pupils, making it the largest in South Shields. Cleadon Village Junior School was opened in 1908, with Mr J R Ribbon, the first headmaster, in charge of 96 pupils. M. Robinson taught at Cleadon Village Juniors in 1958, where discipline (like many other schools) was maintained by the cane. Andrew’s research revealed that in 1921, a pupil was caned for not obeying a teacher. Two years later another pupil was caned for stealing turnips. In 1925 a pupil got two strokes of the cane for being rude to a teacher as did another in 1926. “Discipline was strict but fair, according to the school log books which I have read,” says Andrew. Another ex-pupil, known simply as June, told how, despite “liking school”, she had her hand slapped for doing badly at maths. “Nevertheless, she passed the 11-plus exam in 1931 and went to the Grammar School. “From 1940 to 1943, many pupils from South Shields were evacuated because of the German bombing. The pupils returned in 1943 because the bombing had stopped and pupils were homesick,” added Andrew. The historian will be revealing more about school days of the past on South Tyneside in future articles. What do you remember about your school days? Please get in touch with your recollections.